For the ladies, and the guys too: Deciding which gun is best for you. How many times have you walked into a gun shop only to be greeted by a gun store Rambo with too much testosterone and not enough common sense? It’s happened more than once to my wife and I. Most of the time they have a personal agenda and try to steer you to this gun or that gun regardless of how it fits you personally. If you want a compact gun it has to be this Glock or Sig Sauer and if you want a full sized gun it has to be this 1911 or a Heckler & Koch. This may be because they have the most mark up on this weapon and get more cash when they are sold or it may be because they just prefer this brand or that the other. The truth is far too few people know or understand the basics of purchasing a weapon for a specific use. My wife and I recently purchased her first handgun. We looked for a very long time and to be honest, I got rather frustrated doing so (one of the reasons for our consulting service). She is tiny and wanted a tiny gun to go along with her tiny frame. The problem is that she also wanted an effective fighting sidearm that would protect her and our family. Things got difficult very quickly when she had her heart set on several guns that simply didn’t fit her. We looked at a lot of guns from sub compact Glocks to smaller caliber guns like the Walther PPK and PK 380. Nothing seemed to fit her and accomplish the end goals we both had in mind. One of these guns was a Walther PPQ. This is a great gun, but it didn’t fit her hand well and the ergonomics of the frame didn’t disperse the recoil well through her upper body. It was actually painful for her to shoot it. She went through a few others and even shot my Beretta 92 several times. This process turned into several weekend trips and visits to almost every reputable gun shop in the Raleigh/Durham area. One thing that most first time buyers don’t consider is that the smaller the gun the more recoil it has, even in a smaller caliber. It’s simple physics, and a compact .380 will have as much or more recoil than a larger 9mm on a full sized frame. The smaller the gun, the less ammunition it will also carry. So think about the purpose of your handgun. My wife is of the same mind as I am. If either of us has resorted to using a gun, then the situation has gone terribly wrong and we want as much firepower as possible. So after shooting many guns and having several long discussions with both myself and the owner, Rob, at Clayton Guns, she ended her search with a Smith and Wesson M&P Pro in 9mm. Yes this is a full sized gun, but with careful consideration it can be concealed easily. Fortunately, after dealing with the general bravado from many gun shops, we met Rob who is a wealth of information and had no agenda other than to get my wife the right gun for her. This brings me to my first point; find a shop you can trust and have someone with you that really knows their stuff when it comes to the basics of handgun manipulation and control . Just because a gun looks cool and comes highly recommended by a magazine article doesn’t mean it will fit you and be the best gun for you. Shoot or at the very least hold as many guns as you can to test fitment to your hand. Many of the newer polymer guns have interchangeable back strap panels. Try them out and get a feel for the guns. Then decide on the purpose of the gun. Are you carrying it in a holster, purse or pocket? Do you open carry or do you always carry concealed? Will this be your only gun or will you have multiple guns for multiple situations. Only after you decide how you will use the gun can you purchase a weapon that will fulfill its main purpose. You then need to make sure it isn’t what I call an orphan gun. Orphan guns are more unusual or unpopular guns that don’t have huge aftermarket support. If you buy one of these guns then accessories will be difficult or impossible to find. In the best case scenario you will pay top dollar from a custom holster maker so that you have equipment that fills your needs. The only other option is to build your own holster system with Kydex or use a one size fits all nylon holster that isn’t what you really want or need. The caliber of your gun is the next thing that you really need to decide on. For the guys, buying the largest caliber possible to compensate is just plain silly and really dangerous. Male or female you need to choose a caliber that you can easily control, especially if you are not an experienced shooter. If you can’t make quick follow up shots or you need to adjust your grip after shooting several rounds, then it isn’t the gun for you. I’ve said this before and I will say it again, there is no magic caliber. The “one shot stopping power” of a particular round is somewhat a fallacy that causes people to make decisions that hinder their ability to learn the basics and become competent marksmen. I’m a really big guy and can handle anything you put in my hand, but I choose to carry a 9mm due to the fact that I am at my best when shooting this round. I can cut the 10 ring out of a target and transition between multiple targets quickly and it has more than adequate stopping power when using modern ammunition. So now you have a gun that fits you, you know how you intend to use it, and you’ve decided on caliber; what’s next? Now it’s time to train, try different holsters and modes of carry. Make your weapon an extension of your body. Your life depends on your ability to be proficient with your new purchase, so get to work! Shooter’s Choice Grease. It works very well but it’s expensive for what you get. Today I’m going to get going on a category that is near and dear to the hearts of all shooters everywhere. Cleaning and lubricating products. For years I was an uncommitted user of many different products to clean and lubricate my firearms. I’ve used many different options, from the standard CLP (Cleans,Lubricates,Protects) from my military days on up to using automotive greases and some purpose made lubricant greases for firearms. I will say that everything that I’ve used works and works fairly well. I certainly can’t complain about any of the products that I’ve used because they all work. Each lubricant used is purpose made to lubricate machinery or engines or of course firearms in particular. Ed’s Red made from several different automotive lubricants. Works well and cheap, but you don’t want to breathe it. Perhaps one of the cheapest solutions I came across in my research of cleaner/lubricants was a homemade option known simply as “Ed’s Red”. This product is a concoction of several different automotive lubricant products all put together to create a very large amount of homebrew gun oil. I have a supremely large amount of it still sitting in my garage ready for widespread use on lots of guns for a long time. All of these products have a flaw however, if you can really call it that. Everything I’ve used is all petroleum based and toxic (albeit in large amounts) which as I get older and spend more and more time with my 4 month old son isn’t all that desirable. For 8 years I used solvent tanks and copious amounts of Gov’t issue CLP with bare hands and often times I would take my chow break… or more likely at that point in my life, a smoke break without washing my hands to clean off these hazardous chemicals that had been absorbing into my skin for the last couple hours. I never gave this a second thought frankly and I shudder to think about all the chemicals I’ve ingested over the years. Don’t worry though, there is another option. Today we’re going to go over a fairly new product simply known as FrogLube. This is a CLP product that is made from an all natural and non-toxic compound of plant material. I initially dismissed this product to be honest. I thought to myself that there is no way this could be as good as my old tried and true methods. I can report today that my initial thoughts were incorrect. I had done some more research on the product and found it to be a very interesting idea and my mind went back to those days sitting on a bench cleaning tons of M-4’s without gloves and the idea of a non-toxic, non-petroleum based product was looking very good. I bit the bullet and ordered a 4oz tub of the paste variety of the FrogLube. I was excited to try this stuff out so since I had just purchased a new firearm I thought that this would be a perfect platform to test this lubricant. FrogLube is a product that requires seasoning of the metal, kinda like a cast iron skillet. You heat up the metal gun parts and apply the FrogLube all over and let it sit for about a half hour to an hour and once cooled you simply wipe it off. When the firearm is shot and warms up, the FrogLube leeches out of the pores in the metal creating a liquid barrier for the friction points. This allows you to run your firearm “dry” or with only a very thin film of lubricant applied to the friction points. The paste variety of the FrogLube will melt its way into all the nooks and crannies of your firearm, making it pretty easy to apply. In my research I found that it is recommended to apply two treatments of this product initially for optimal performance. I broke down my Kel-Tec SU-16C and began the cleaning and treatment process. Using my wife’s hair dryer I heated up the metal parts of the rifle and began to apply the FrogLube. The application process went very quickly and easily as this rifle was brand new and only required minimal cleaning as I went. After the parts cooled I wiped off the excess lubricant and found the parts to have a very slick feeling to them, almost as though they had been well broken in from hundreds of round of shooting. The very next day I treated the rifle with FrogLube a second time and the results were similar to what they were yesterday. There was a very nice slick feeling to the metal parts which as I have discovered is also a water resistant protective coating as well. The next day I took the Kel-Tec to the range to break the rifle in. This particular rifle is noted in the owners manual to require a 200 round break-in session to ensure subsequent reliability. Since treating with the FrogLube the rifle ran flawlessly only having a double feed malfunction, I wasn’t the shooter during that string of fire and can’t comment on that malfunction and after it was cleared there were no more hiccups with the rifle. I got this rifle very hot and after it cooled down and I brought it home I broke it down to clean and it simply wiped clean without scrubbing or excessive effort. My final impressions of this product are that I’m excited about it. It’s a Non-Toxic U.S. made product from a veteran owned business that has a fantastic wintergreen smell to it. You can apply it with your bare hands safely (be cautious though since the parts you will apply it to are going to be very hot). Very simply this product works and works well. Since my test at the range the other day I have since treated two of my pistols and my daily carried CRKT M-21 knife. The CRKT is prone to rust from moisture and sweat from wearing close to the skin in my pocket. I haven’t seen any rust on the blade since FrogLube was applied. If this product meets the criteria that you are looking for, I have no reservations recommending it to you for whatever use you can find for it. As for now stay safe, train and have a good ‘un. Ok folks, today I’m going to get us started off with perhaps one of the most widely adopted weapons platforms in the U.S., the 5.56mm/.223rem semi-automatic sporting rifle/defensive carbine. When most think of this platform, they immediately jump to the AR-15 series of rifles. These are a battle proven design that I carried for many years in the U.S. Army and placed my life on the line with on more occasions than I would have liked. 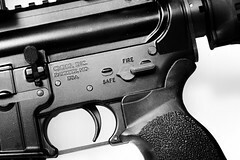 The AR-15 today is one of the most reliable and adaptable platforms known to man. There are pistol variations and sniper variations and everything in between. Perhaps the most widely used is the 16″ barrel model which is the shortest legal barrel length for a rifle under the National Firearms Act, that is without paying for a $200 tax stamp and registering it as an SBR (short barreled rifle) but we will get to that another day. This is a common work around for the “dirty” gas impingement system. The AR platform is of course not without it’s drawbacks. First and foremost is that they are generally expensive. It’s not uncommon to see rifles on the rack at your local dealer with a base price of over $1,000. Now I don’t know about you but I don’t really have a grand sitting around that’s really all that disposable for a firearm purchase. The other problem with the cost is that generally that $1,000 will only get you a base rifle with no bells and whistles that are so popular today. They also work off of a direct impingement gas system which is a fairly dirty way of doing things. This system uses a tube from the gas block to vent hot gasses and carbon from the barrel back into the upper receiver to push the bolt carrier group back against the buffer and recoil spring. This causes a buildup of carbon and fouling inside your upper receiver and in your trigger group in the lower receiver as well. There are short stroke gas piston models that utilize a piston to drive the bolt carrier group instead of the hot gas along which certainly run cleaner. I myself have zero experience with this particular system as it was not adopted by the U.S. Military and they are cost prohibitive for me to own (take that $1,000 price tag for a base model and jack it way up). There are also conversion kits to a gas piston system for the AR-15 which seem to be well received. Enter the Kel-Tec SU-16C. At $575(Price paid, MSRP is listed at $770) this 4.7lb firearm is a long stroke gas piston operated carbine with a 16″ threaded barrel. It accepts the same reliable magazines that feed the AR-15 platform which range in capacity from 5rds on up to 100rds and any muzzle device that the AR platform accepts. This firearm is constructed of a glass reinforced polymer known as Zytel where possible and steel where necessary to save weight and reduce cost. It sports a parkerized finish on the steel and the barrel is chrome lined (earlier versions were unlined and newer versions I’m told, will be salt bath nitride treated). It has an integral picatinny rail on the upper receiver for optics mounting and the fore end converts to a bipod to stabilize longer shots. The “star” bolt will look familiar to those of you who know the AR platform. This model also has the underfolder stock that permits the carbine to be fired while folded, and stored very compactly. The front sight was borrowed from the AR platform as well. The operating system for this rifle however, is pure AK-47. Just last week I took my SU-16C to the local range to put it through it’s paces. Prior to my range time I took the time to fit the carbine with an A2 flash hider. Ammunition used was 55gr American Eagle Tactical 5.56mm. The owners manual very clearly states that the carbine requires at least a 200 round break in and that you may experience a few malfunctions during this process. I experienced none, although in full disclosure my buddy that went to the range with me experienced a double feed during his string of fire. The double feed was cleared and no other malfunctions were experienced. Being as my local range is an indoor facility, the range only goes out to 25yds, so that is the distance to which this carbine was zeroed. Sight adjustment is simple and straight forward. If you shoot high adjust the front sight post up. If you’re shooting right, adjust the rear sight to the right. I was able to get a good zero in 9 rounds. Kel-Tec includes a tool to adjust the windage, they do not include a tool to adjust the front sight elevation, so I was left to make adjustments with a pick from my OTIS cleaning kit and a Leatherman Wave Multi-Tool. You can buy a tool to adjust both windage and elevation from Kel-Tec for around $15. This kinda bothered me though. If they are going to include a tool to adjust one sight, why not include the ability to adjust all of them? One issue I experienced was heat. This carbine does get hot, although so does an AR when you put 200 rounds through it in fairly rapid succession. If you intend to do a fair amount of shooting I highly suggest a good pair of shooting gloves and judicious hand placement. My final impressions of this little lightweight carbine are quite favorable. Accuracy is on par with any AR type rifle I have fired. This carbine is well suited for outdoor use when you’ve got miles to cover and weight is a concern. It also makes a pretty outstanding truck/ranch gun. The durability remains to be truly seen as I’ve only done the initial break-in on this rifle but it’s looking promising. Just prior to writing this review I did notice upon a teardown and cleaning that just in front of the hammer, it appears as though the hammer had impacted an area of plastic in front of the trigger housing group and has caused some stress to the plastic. A phone call to Kel-Tec support left me with the answer that this is a common wear point on the SU-16 series of rifles and will not impact the performance of the rifle in any way. I will however be keeping a keen eye on this and make any updates necessary. All in all I’m satisfied with this carbine and look forward to using it for years to come. As for now stay safe, train and, have a good ‘un. Gun Review: Kel-Tec RFB – The Big Bullpup!